ST. GEORGE — Region 9’s high schools recently announced this year’s all-region team, as selected by the coaches. 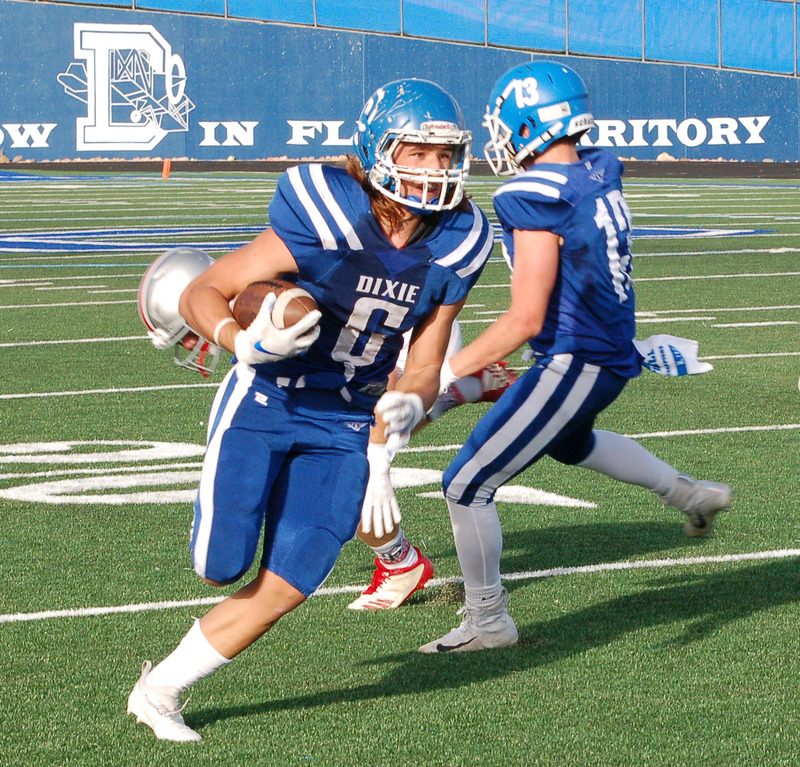 Dixie High School senior middle linebacker Jake Staheli was named the overall Most Valuable Player for Region 9, while Dixie junior quarterback Reggie Graff was named the offensive MVP and Pine View senior linebacker Koa Isaacs-Katoa was named the defensive MVP. Staheli, a three-year starter, played a key role in helping the Flyers to an 11-2 season, including finishing runner-up in the state 4A championship. Staheli led the team with 75 tackles, including 15 for loss. He also made two interceptions and had five fumble recoveries. 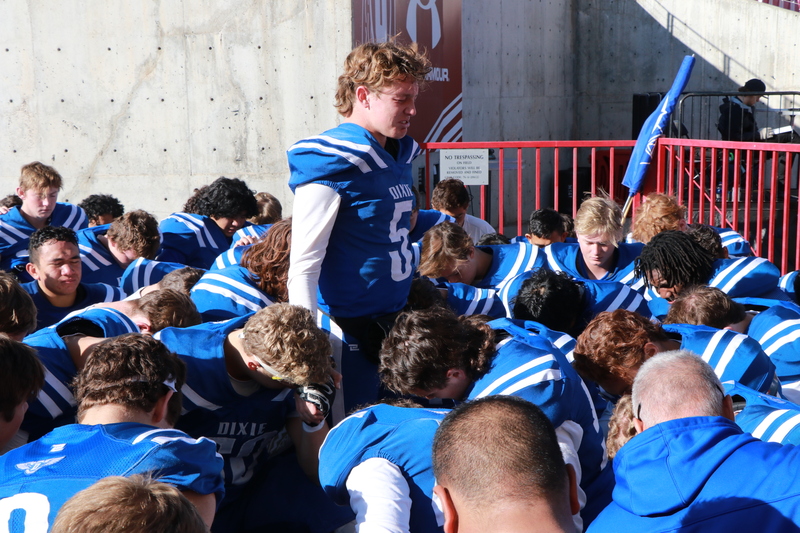 “Jake is one of the leaders on our team,” Dixie head coach Blaine Monkres told St. George News. “He worked hard every day in practice to make himself and his teammates better. I knew early in the preseason that he was going to be a good player while going against him in practice. “He is a guy that likes to put in the time, whether it is in the weight room, on the field or studying film,” Monkres said. Graff’s impressive season stats included completing 170-of-300 passes for 2,455 yards and 24 touchdowns, while throwing just 4 interceptions. He also rushed for 675 yards and scored another 14 TDs on the ground. Defensive MVP Isaacs-Katoa led the Panthers with 51 tackles this season, including 3.5 sacks. Additionally, Pine View senior Connor Brooksby was named the region’s top kicker. Brooksby converted 72 PATs this season and kicked 10 field goals, bringing his career totals to 209 extra points and 33 field goals. 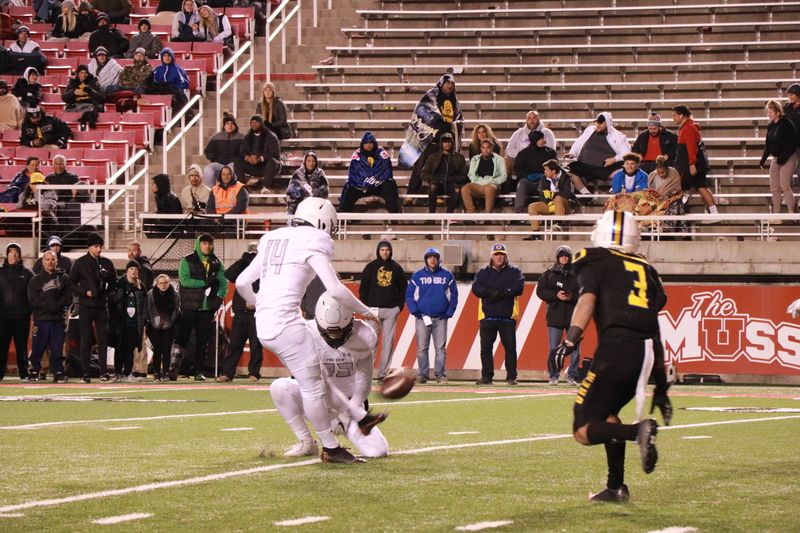 Both marks are the second-highest career totals of any Utah high school athlete. He was 11-for-11 in PAT kicks during the Panthers’ 77-13 win over Hurricane on Oct. 4. Also receiving regionwide special teams honors were Desert Hills punter Logan Callister and kick return specialist Braydon Cavalieri of Canyon View. Jake Staheli, Dixie, MLB (overall MVP). Reggie Graff, Dixie, QB (offensive MVP). Koa Isaacs-Katoa, Pine View, LB (defensive MVP). Connor Brooksby, Pine View, K.
Logan Callister, Desert Hills, P.
Braydon Cavalieri, Canyon View, KR. Bronson Andrus, Desert Hills, MLB. Kaige Baird, Desert Hills, DE. Jarron Polu, Desert Hills, OLB. Kina Tafua, Desert Hills, RB. Mason Creager, Desert Hills, OT/DE. 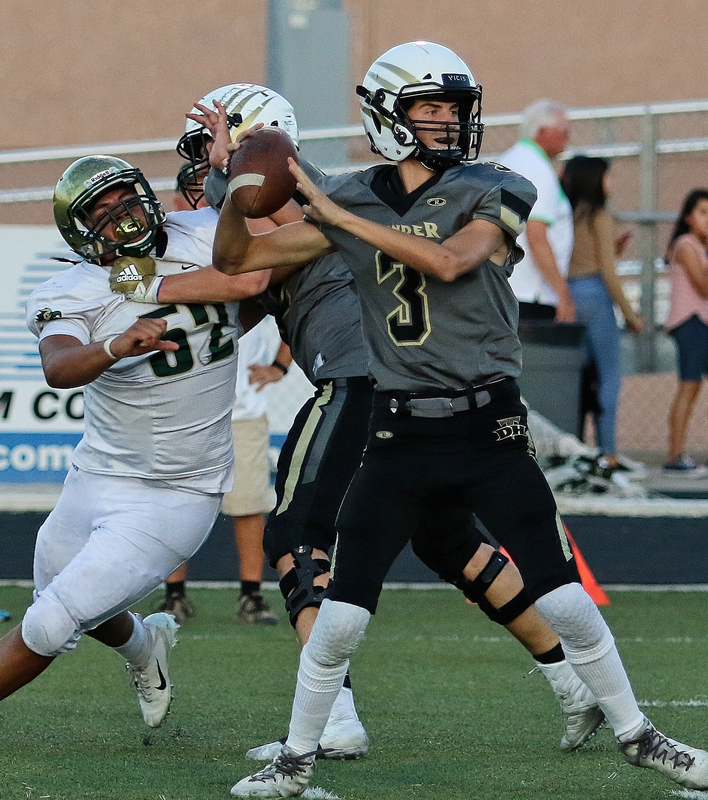 Ryan Warner, Desert Hills, C.
Dallin Brown, Pine View, QB. Jeshan Allen, Pine View, SS. Tosh Wright, Pine View, RB. Solo Katoa, Pine View, OL. Brooks Maile, Pine View, DL/OL. David Park, Snow Canyon, OL. Miles Reynolds, Snow Canyon, LB. Brock Nowatzke, Snow Canyon, FS. Tui Kanosh, Snow Canyon, DL. Brady Lowry, Canyon View, DB. McCray Webster, Canyon View, OL. Colten Shumway, Canyon View, QB. Dawson Mayfield, Desert Hills, SS. Leato Sewell, Desert Hills, OG. Enoka Fuailetolo, Desert Hills, OT. Mason Liti, Desert Hills, OG. Gage Baird, Desert Hills, WR. Tim Colburn, Pine View, OL. Bridger Barney, Pine View, OL. Macloud Crowton, Pine View, QB. Tiloi Lolotai, Pine View, OL/DL. Izaiah Moten, Pine View, WR/SS. Daylor Rymer, Pine View, WR/DB. Gavin Bateman, Pine View, WR/DB. Michael Moore, Pine View, WR. Jase Mendenhall, Snow Canyon, WR. Carson Holyoak, Snow Canyon, DB. Ryan Bethers, Snow Canyon, RB. Austin Anderson, Snow Canyon, WR. Jayden McKee, Snow Canyon, LB. Isaac Lees, Snow Canyon, DL. Tyler Simmons, Snow Canyon, OL. Marshun Swinney, Snow Canyon, WR. Gavin Carter, Canyon View, DL. Ryan Christiansen, Canyon View, OL. Hunter Anderson, Canyon View, LB. Shelby McIntosh, Canyon View, OLB. Joe Pulica, Canyon View, OL. Alex Allen, Canyon View, FB. Kyson Parker, Canyon View, OL. Bo Barben, Desert Hills, WR. Logan Wilstead, Desert Hills, QB. Tate Denos, Desert Hills, WR. Kooper Kenny, Desert Hills, CB. Damon Brunson, Desert Hills, DT. Luke Watson, Desert Hills, OLB. Connor Johnson, Pine View, C.
Sam LeFevre, Pine View, WR. Brock Shaw, Pine View, LB. Colby Hansen, Pine View, LB. Filipo Tavita, Pine View, DL. Uelese Matavao, Pine View, LB. Vlad Joslin, Pine View, C.
Dylan Larson, Pine View, DE. Braxton Hickman, Snow Canyon, LB. Carson Hansen, Snow Canyon, DL. Bretton Stone, Snow Canyon, RB. Wesley Tauanuu, Snow Canyon, LB/SS. Landon Frei, Snow Canyon, QB. Jacorey McKeever, Snow Canyon, OL. James Brown, Snow Canyon, OL. Jaden Erickson, Snow Canyon, OL. Trey Fowler, Canyon View, DL. Hayden Springer, Canyon View, WR. Karsten Jensen, Canyon View, WR. Braden Floyd, Canyon View, LB. Gabe Blad, Canyon View, OL. Tanner Hardin, Canyon View, RB. Adam Kurtz, Canyon View, DL. The all-region teams, including MVPs, were selected by the Region 9 coaches. I agree with Mj1fann. The coaches don’t vote, they pick. All State is run the same way. You are given a slotted number of picks based on how you finished in region or state. My picks are: Graff, MVP – Obvious Leader; Brown – Offense – Talented competitor; Andrus- Defense, sorry the other gift was unbelievable; Kicker- Callister- led state in punting, field goals made and was 100% on all P.A.T.s- no one else could make that claim. Coaches, quit picking your favorites based on how well they did in the weight room. So what you are telling me is they receive a reward for being popular? That is not right. Bronson Andrus was 3rd in the state in tackles Koa was 210th in the state in tackles. Not even close. Coaches should be ashamed of them selves for not looking a stats and going off of popularity. Brown from PV was hands down the biggest offensive threat for any team but he is labeled as a bad boy so he gets nothing. Something needs to change in the way they vote!! !